Once a winery tucked into the high cliffs overlooking an ancient volcanic crater, these 300-year-old wine caves have been renovated . . .
Once a winery tucked into the high cliffs overlooking an ancient volcanic crater, these 300-year-old wine caves have been renovated as snug guest houses located in the cradle of Aegean architecture. Individually designed in the Cycladic style, the fourteen one-bedroom houses are the essence of tranquility: softly curved walls, domed ceilings, handmade accents, rustic furnishings, and private terraces commanding panoramic views of the black-sand beaches and deep blue waters. 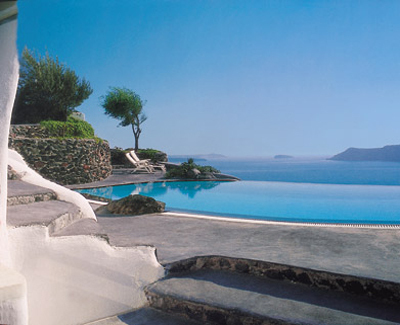 With a dip in the sculpted freshwater pool or a glass of local wine from the terrace bar, relax and enjoy the warmth and serenity of Greek island life.